I recently had the pleasure of reading this novel over our Christmas vacation. I found the coziest spot in the house and buried myself away for hours at a time reading this book. 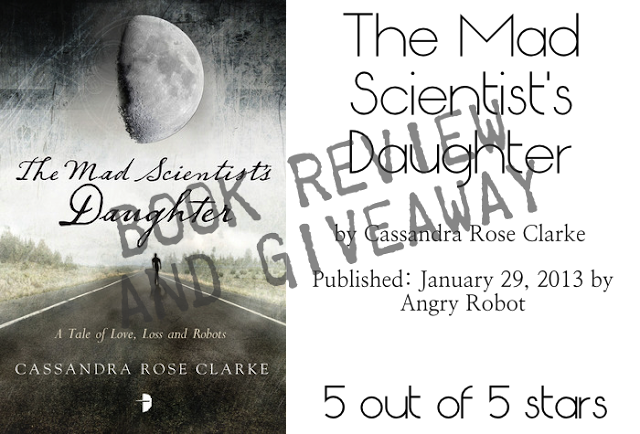 The story is about a girl who lives in a remote rural home with her parents who are both scientists. From a very young age, she has lived with an android as a tutor and friend named Finn. The story moves from childhood to adulthood and shows the evolution of their relationship from friendship to love. The story moves quickly. It's essentially a coming-of-age love story. It progresses smoothly over the events of Finn and Cat's lifetime showing the evolution of their relationship from beginning to end. It doesn't settle too long on one time or event, but you are still somehow able to connect to the characters. The characters and setting are realistic. These people are not perfect, but sincere. I love that this is a sci-fi topic written in such realistic and normal settings. This is not some super futuristic society, but a world very much like our own. This is what makes the story so thought-provoking. The whole idea of android/human coexistence is not that far-fetched after all. We do have phones and cars that interact with us on command. Watching these two characters fall in love and struggle with what it means to be human, I found the whole topic to be truly beautiful. I love this story, and I love that she wrote it. I truly hope you read it. Trust me, you will fall in love with Finn too. I was so caught up with it, I immediately emailed the publisher and practically begged them to offer you guys a free copy. I just had to get this book into as many hands as I could. I loved it that much. And guess what....they agreed. So here's your chance! You can win your own copy of The Mad Scientist's Daughter! All I ask is that you please be a follower of Sweet Green Tangerine via Google Reader or Bloglovin. Just leave a separate comment for each entry with your email address and/or your name on Goodreads. It's that easy! Winner will be chosen on Sunday, February 3rd at 11:59 EST. This book sounds so good! I've been searching for a good new book to read. Even if I don't win a copy it sounds like a good one to add to my Kindle library!! Added to my goodreads list! This sounds like a great book! If I don't win it I will have to buy it...or get it from the library. I love your book recommendations. The title itself is very impressive. I will try it. The book sounds really great! I follow you on GFC. I added the book and you to my Goodreads. I love finding new books and authors!!! Follow you on GFC and Bloglovin. I'm a fellow book lover. Following you via GFC. I also love Goodreads. I added to to my Want To Read list. Hope I win! Following you on GFC! This book sounds so good! Thanks for the opportunity. I follow you on GFC via Google Reader. I added the book to my Goodreads collection. It looks super interesting and I've been watching the show, "Boardwalk Empire" and "The Bachelor" so I've got complicated romance on the brain. I added The Mad Scientist's Daughter to my "to-read" list on Goodreads. (and I'm your friend on Goodreads, so I should *totally* win, hehe!). Oooo pick me, pick me! :) I follow on GFC.